This year, we’ve decided to forgo the traditional end-of-year wrap-up for our first blog of the year. Instead of bragging about our visitor statistics and the popularity our programming (both great! ), we’ll talk about what’s coming up for early 2019. However, I’m afraid I am going to immediately cheat and go back to last fall when we held a vernissage for our current special exhibition. 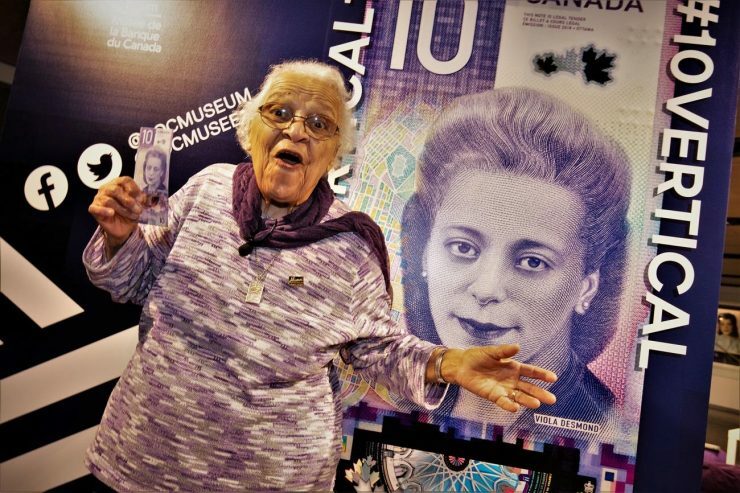 Called A Noteworthy Woman, the exhibition is about the life of Viola Desmond and the new $10 dollar bill that features her. Senior Deputy Governor Carolyn A. Wilkins, our Director Ken Ross, Russell Grosse of the Black Cultural Centre for Nova Scotia and Wanda Robson, sister of Viola Desmond, spoke to a crowd of 130 guests at this, our first exhibition opening. In the audience were community stakeholders as well as colleagues from national museums, including the Canadian Museum for Human Rights. A Noteworthy Woman will be on display here at the Museum until May 12, which more than qualifies it as a 2019 event. Check back periodically about future programming to accompany this exhibition. 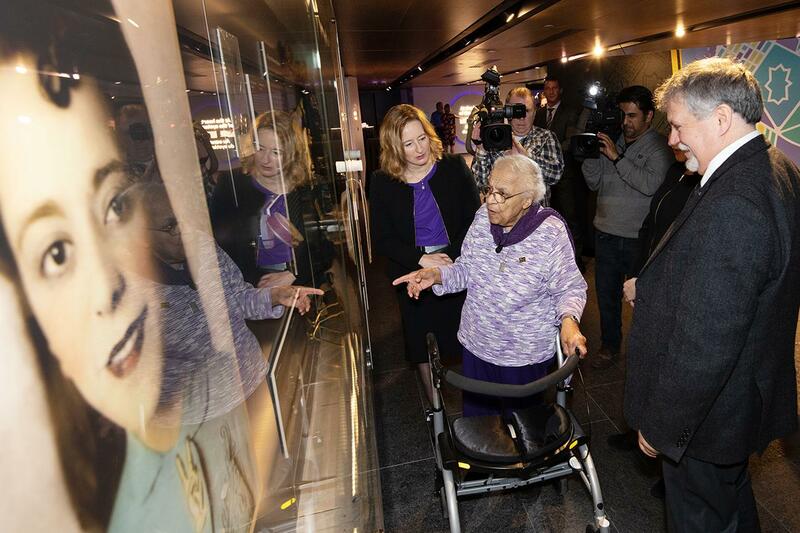 The irrepressible Wanda Robson, sister of Viola Desmond, was a very special guest and a big hit at the opening event of A Noteworthy Woman. A Noteworthy Woman has a number of artifacts from Viola’s life that have never before been exhibited. Museum Director Ken Ross takes Wanda Robson and Senior Deputy Governor Carolyn A. Wilkins on a tour of A Noteworthy Woman. And now on to the future—well, the Museum’s near future, at least. Our agenda for 2019 includes participating in a number of local community events and festivals over the year. The first big festival is Winterlude, the National Capital Region’s big winter fest taking place from February 1 to 18. There’ll be plenty of action on nearby Sparks Street with live entertainment on the Capital Pride stage. Outdoor food, ice sculptures and chilly carnival games will line this popular pedestrian mall, and we’ll be right there every Winterlude weekend with activities for the entire family. Making puppets, building your own tea brick or doing some hands-on learning with a Métis fur trapper are just a few of the activities visitors will enjoy as they come out of the cold and into the Museum this February. 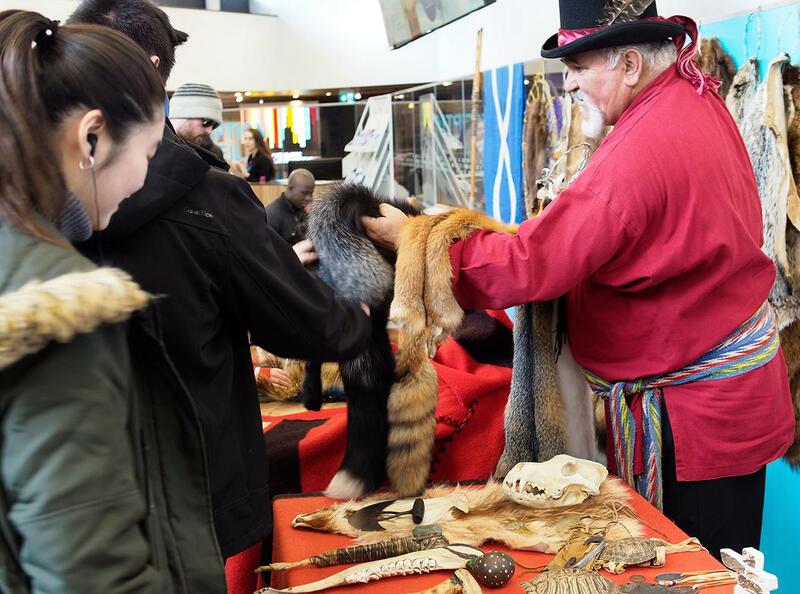 Educator and trapper Archie Martin returns in 2019 with his travelling museum of furs and trapping gear. 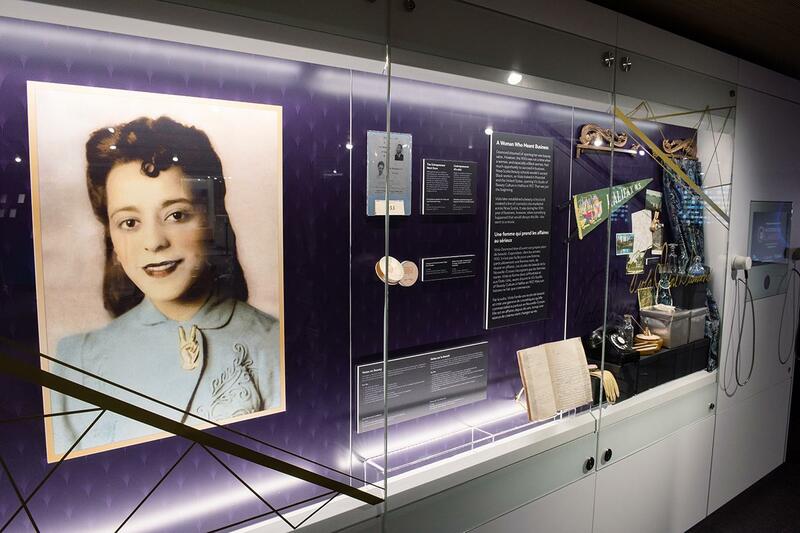 February is also Black History Month, and on February 23 we’re inviting you and your family to learn about Viola Desmond’s life, work and the inspiration she has become for Canadians. Join poet Nadine Williams as she reads her poem, Viola’$ Ten. Then, in a poetry-writing workshop, you will have a chance to write your own verse about someone you find inspiring. During March Break, many families will be looking to museums to provide activities for kids, and we’ll be doing just that with story times and conducted tours of A Noteworthy Woman. Our hands-on crafts, such as making your own bank notes, are money-themed activities designed to entertain and inform. Special guests this March will include our friends from the Royal Canadian Mint and the Royal Canadian Mounted Police who will answer your questions about coins and counterfeits. If it looks like March’s special guests reflect a theme, that’s because it’s also Fraud Prevention Month, an event that couldn’t be more appropriate for us. Check the Museum website next month for details or, better yet, follow us on Facebook! 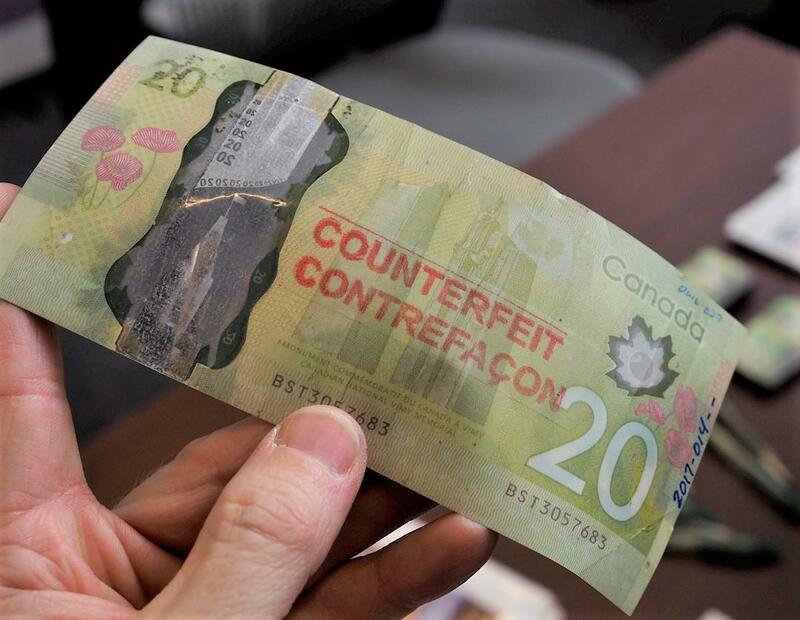 Counterfeiting is always a popular subject during Fraud Prevention Month. You get to handle the real thing (well, the fake thing). But enough of events. We are just getting underway with our educational programming and will introduce two new school programs this spring. Inflation Busters is a game-based program for students in grades 10–12. How do you plan for the future or run a business when you don’t know what things will cost? Get a grip on inflation in this fun and informative game. Also coming off the program assembly line is Trading Planets. For grades 4–8, it places students in an interplanetary economy where they learn that trading without a common currency is very difficult indeed. Who knew that learning about money and economics could be fun? We did! I doubt your credit cards will work off planet Earth, so you’ll need “spacebucks” from our Trading Planets program. We look forward to seeing you at any of our events or programs this season. Or just come in to see the Museum anytime! Keep informed about everything that’s happening here on our webpage and stay in touch by following us on Facebook and Twitter.